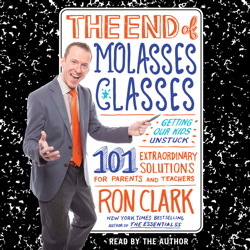 A new book from bestselling author, award-winning educator, and founder of the Ron Clark Academy provides 101 revolutionary and powerful ways for parents, teachers, and communities to uplift, educate, and raise the children of America. Ron Clark’s breakout bestseller, The Essential 55, lit a fire under parents and teachers everywhere to raise their standards and expect the best from our children. Using the proceeds, Ron established the non-profit Ron Clark Academy (RCA), a revolutionary model school located in Atlanta whose mission is to have a profound impact on the lives and futures of all students who enter. Each year some 3,000 teachers from around the world visit the school to see how thinking outside the box can help create winning results. Now, Ron shares the wisdom he has painstakingly learned from building a school from the ground up. There are many groundbreaking in invaluable lessons here for teachers on how to promote success and get the most from each and every lesson, but this is also for parents and the community, as we all have a share in the responsibility of raising inspired and creative kids. • Only reward excellence. Parents and teachers should have high expectations for their kids and not give a cookie for average work. • Education is a shared responsibility. Parents need to be as involved in their kid’s education as teachers. • Teach to the brightest in the room, but uplift the students who have the furthest to go. • Only the best teachers should be hired and retained. This means increasing pay, but also changing the tenure system. It is time to “Get on the Desk” and make every school in America an excellent school that values every student. This book was exactly what I needed. I had been feeling burned out and "stuck". This book was uplifting and has given me the push that I needed. Ron Clark does an excellent job reading the book. After listening to him read, I feel like I know him personally. Ron Clark is fantastic! He has so many methods that are useful in the classroom in this book. He is also so much fun to listen to as he reads his own book. He adds in little things here and there that aren't written and had me laughing throughout. Great read for sure! This book I AMAZING!!! Ron Clark has great energy, you will hear and feel it. He gives creative fun ideas that can be used for any school setting. This book has me excited about teaching.